One of the last places you’ll want to be when staying on this beautiful island is in the kitchen. Ibiza has an enormous number of restaurants, tavernas, cafes and bars from which to choose. There are places to eat in every imaginable setting – the quayside, on the water, high in the hills, on the beach or in the towns. 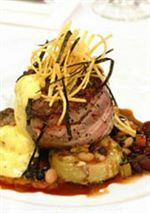 With so many restaurants, the competition ensures that quality is good. Ibiza can combine great cuisine, unique settings and panoramic views to ensure you dine out in style. Spanish cooking is based on a combination of fresh produce and home cooking resulting in some delicious dishes. Of course, with over 30 miles of coastline, one of the things Ibiza does best is seafood. Ideally placed for the freshest seafood and fish you can choose a restaurant overlooking the sea and sample the days catch fresh from the fishing boats. 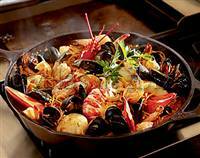 Try some lobster, crab, swordfish or some grilled prawns cooked Spanish style to provide an appetizing treat. As well as fish, important ingredients in Spanish recipes are meat, poultry and game cooked with garlic, olives and sweet and hot peppers. Pies and rice dishes such as paella are popular as are tortillas and casseroles. Vegetarians will find they have good choice of dishes from the many offered by the numerous restaurants vying for tourist trade. Tapas, a selection of small dishes, is great for tasting the variety of flavours Spanish cuisine can offer. Commonly eaten for lunch or with a couple of drinks in the bar, tapas bars are everywhere in Ibiza. Dishes such as olives, cheeses, cold meats, omelette, prawns, mushrooms and squid are just a few than can be shared with a glass or two of wine or a local beer. As well local Spanish fare there are influences from many other parts of the world - Italian, French, Dutch, German ,Thai, Chinese and Japanese restaurants are all around the island. If you really want a taste of home when you’re away, then Ibiza has numerous British influenced outlets. It is not expensive to eat out in Ibiza. You can enjoy the luxury of dining in one of the many restaurants every day on a relatively modest budget. Many establishments have a special lunchtime menu which can cost less than 10 euros for three courses with wine. Ibiza offers a wide selection of drinks to go with your food. Locally produced beer, wine and spirits are available at very reasonable prices as well as the well-known brands. Cocktails, a holiday favourite, are to be found in many of the bars. There are also many delicious non-alcoholic drinks making use of the wide selection of fruit grown on the island.